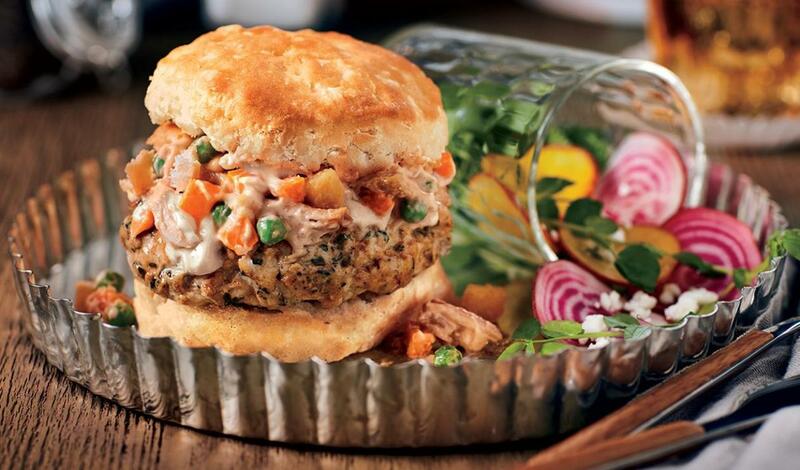 The ultimate comfort food gets the burger treatment: ground chicken sliders topped with pot pie filling featuring carrots, squash, parsnips and peas. Sauté parsnips, peas, carrots, shallots, and acorn squash until softened. Fold in Hellmann's® Real Mayonnaise, smoked chicken and seasonings. Combine all ingredients and mix well to incorporate. Form into 10 patties. Reserve chilled. Cook the Seasoned Chicken Patties to a minimum internal temperature of 165°F and place on the heel of a warm biscuit. Top with ¼ oz. Pot Pie Filling, and biscuit crown. Serve.